Kerala Blasters blew a two goal lead in the space of 12 minutes to NEROCA and were knocked out of the Cup in the first stage. With only the last spot up for grab in the quarterfinals, goals from Chidi, Williams and debutant Joachim were enough for the side from Manipur to grab the last spot. Here are the major talking points from the game. Oh James, What have you done? Kerala Blasters began the match in an emphatic fashion, bossed the first half and took a 2-0 advantage in the first hour of the game. Pekuson and Pulga had a great game in the centre of the park and were completely overrunning the NEROCA midfield. With a 2-1 lead James opted to substitute Pekuson who was their best player in ISL and also in this match. The substitution completely took off the venom from Kerala Blasters as young Negi struggled to do his defensive duties while offering nothing in the offence. On the other hand, Gift Raikhan made two effective changes that changed the entire complexion of the game. The young Pritam embarrassed Lalruatthara, the emerging player of ISL in a stunning display of direct football. 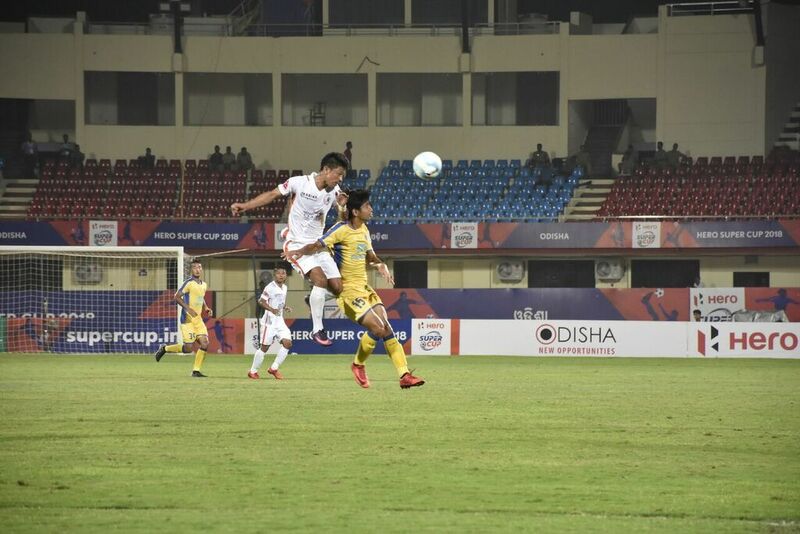 Though Pekuson could have done very little to stop the second goal, he could have definitely pinned back NEROCA at the final stretches of the game. It is not easy in your first season at the top level. But for this young side from Manipur, it has proven to be a cake walk. They mounted a serious title challenge in their very first season at India’s top tier league. They started this game poorly but showed immense composure to stage an enthralling comeback. The most experienced teams often crumble under the pressure of being 2-0 down in a knockout fixture but their courage and composure is praiseworthy. NEROCA has proven in every single aspect that they belong at the highest level. When AIFF organized super cup they must have secretly prayed that the ISL teams dominate the cup. On the contrary while few teams have played their second string 11, few ISL teams have been schooled by their I-league counterparts. A league with no relegation is apparently the demand of ISL teams and AIFF merger is rumoured to include only few clubs from I-league. On the back of this brilliant showing by the I-league clubs the AIFF will face tough questions on which teams will make it to the merged league. With time running out, the next two years will be very crucial for the fate of club football in India. Oh Kerala. It is very hard to not feel bad for Kerala fans. From losing a final on penalties in their own backyard to finishing at the very bottom of table, the Blasters fans have endured it all. However they would have been filled with optimism for this tournament. James played his best 11 and the team took a deserved 2-0 lead. It all came crumbling down like a stack of cards in the space of 12 minutes. James has promised to usher in a new era for the blasters but so far, it’s the same old story in just a different tournament. What's the best fit league for Neroca FC next season?